The biggest mistake in billboard advert history has been spotted in India. An Indian billboard ad used to pay tribute to late South African President, Nelson Mandela has a different photo in it. 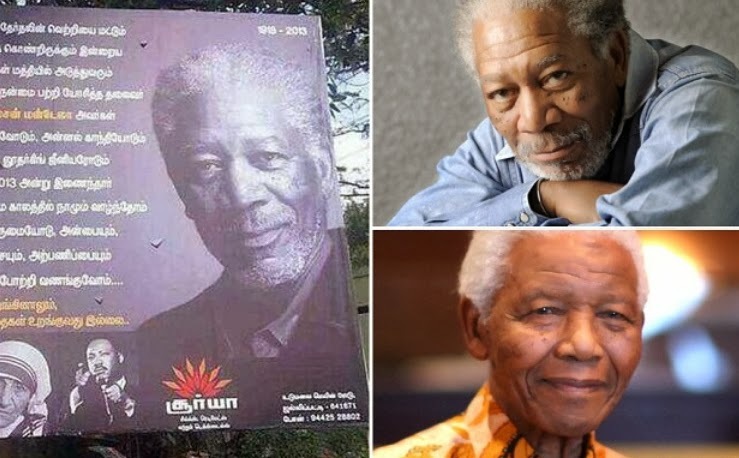 The memorial placed in Coimbatore city displayed the photo of Hollywood actor Morgan Freeman instead of Nelson Mandela. Morgan Freeman played the role of Nelson Mandela in 2009 movie titled Invictus which is probably the cause of the mistake. A clothing merchant who sponsored the billboard has been notified. This is probably the biggest mistake in billboard advertising. There is little resemblance between Morgan Freeman and late Nelson Mandela. The Hollywood actor won’t find this funny at all. This show how local some people are in India today. These are people calling Nigerians all sort of names.